Home Life Stop and Smell the Roses! Life was meant to be lived and we should stop and take in the moments that build up our memories! As I sat and watch the movie named, “Mr. Church” it lit a fire in me to start writing for my blog again, after taking over a year off unintentionally. If you’ve never seen the movie, Eddie Murphy is the featured star. He was hired as a cook and personal assistant to a dying mother and her young daughter named Charlie. He helped to mold the life of Charlie and the bond that grew between them was inseparable. Life didn’t pan out for them as they would have hoped but the memories they created lasted a lifetime. Sometimes life can become so mundane and repetitive especially as a single parent. Recently my bestie came to town for a short trip. I used her time here to stop and smell some roses with her and I was able to check some items off my bucket list. 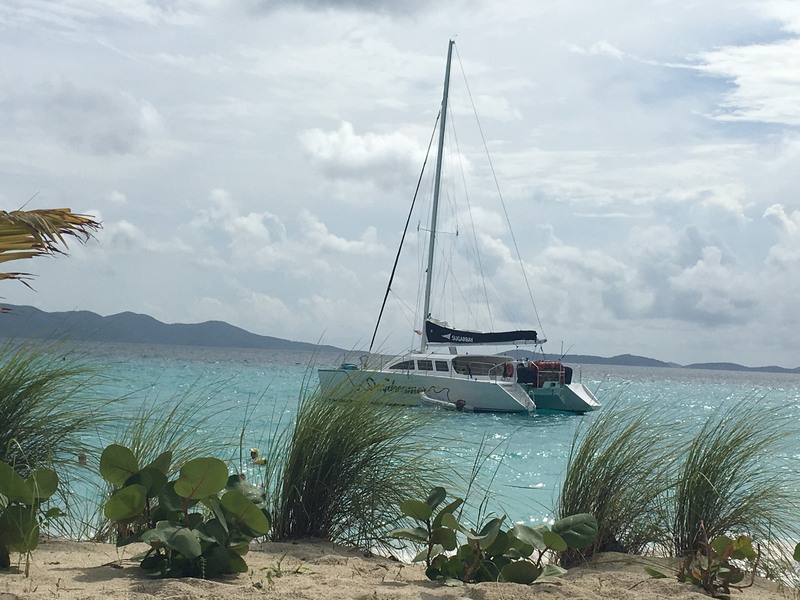 We took a day trip aboard a private catamaran sailboat to the islands of St. John, VI and Jost Van Dyke, BVI. 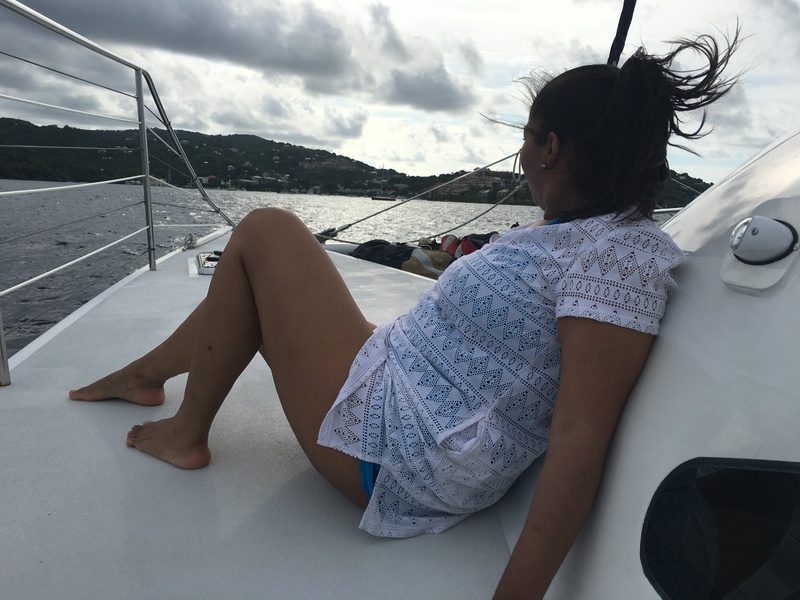 The weather was perfectly overcast allowing us to enjoy laying out on the deck, taking in the beautiful islands and keys around us. 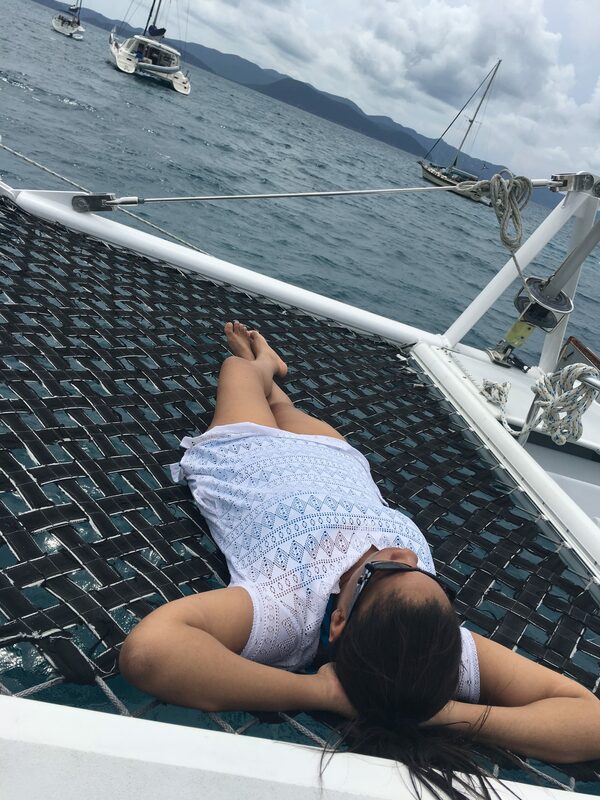 When you are in the middle of the deep blue ocean you have no choice but to sit back, enjoy and take in the beautiful sights of nature. Seeing the vastness of the ocean compared to little old me, I couldn’t help but to be reminded that I am not in control. All I could do was keep thanking God for allowing me to enjoy his beautiful creation. My mind wondered how much more beautiful Heaven would be! 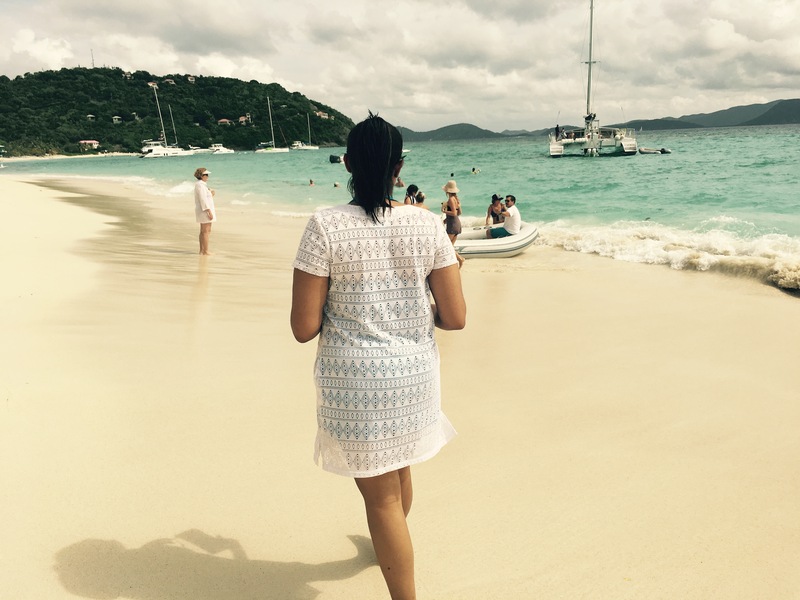 Our first stop for the day was to a private beach off the south side of St. John, U.S. Virgin Islands. 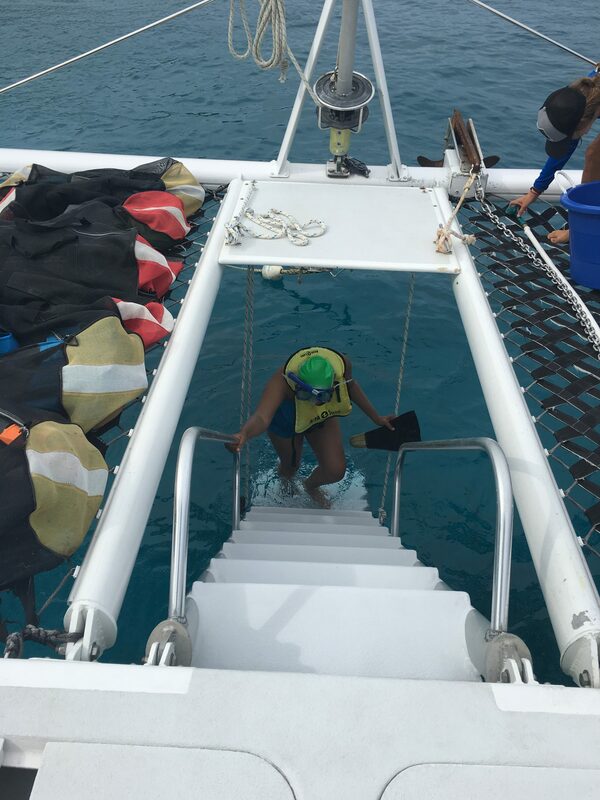 There I attempted to snorkel in the deep blue ocean. What an experience that was (lol). As I saw the deepness of the ocean floor beneath me and the beautiful sea life in it, I was in total awww!!! I could see the bottom of the ocean, thousands of feet below as bright and clear as though I was looking through a crystal ball. 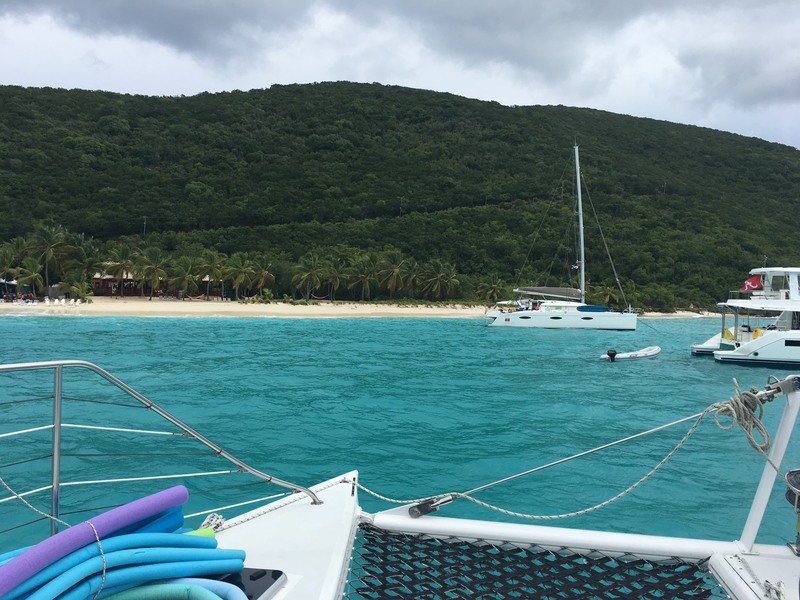 We then headed over to Foxy’s and Soggy Dollar in Jost Van Dyke. The crystal blue waters of Soggy Dollar Beach was mesmerizing. I’ve never seen such beautiful waters before, even though I grew up the Caribbean my entire life. 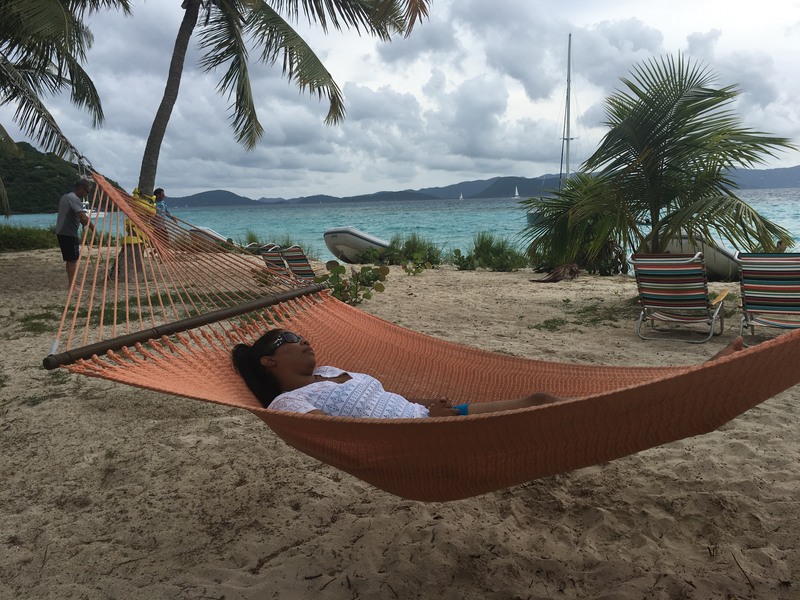 It was like a hidden gem of the British Virgin Islands. 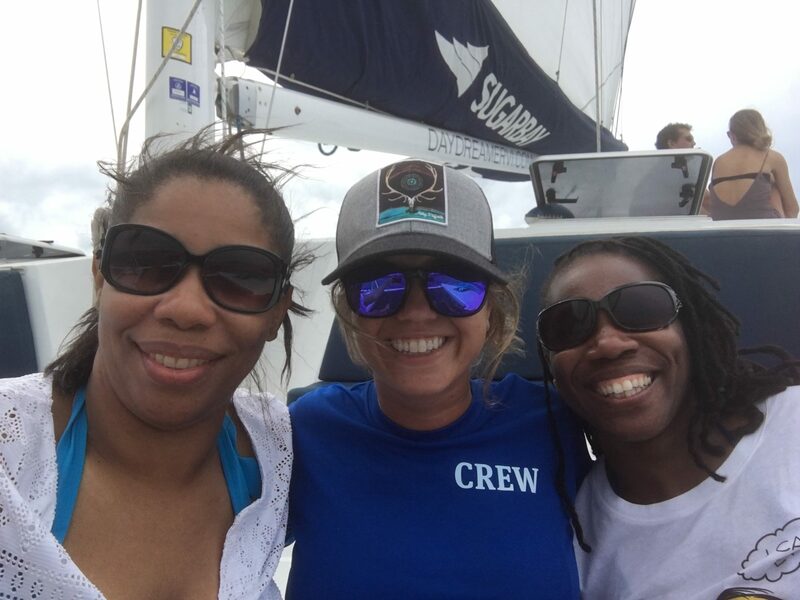 The adventure of riding in a small dingy to get to and from shore was filled with laughter as we got drenched by the passing waves. We laid out in hammocks sipping fruit drinks under some coconut trees. We ate at the famous Soggy Dollar Restaurant (ate fresh Mahi Mahi fish). The Soggy Dollar Beach got it’s name from persons swimming to shore and paying for their food & drinks with wet soggy dollars. 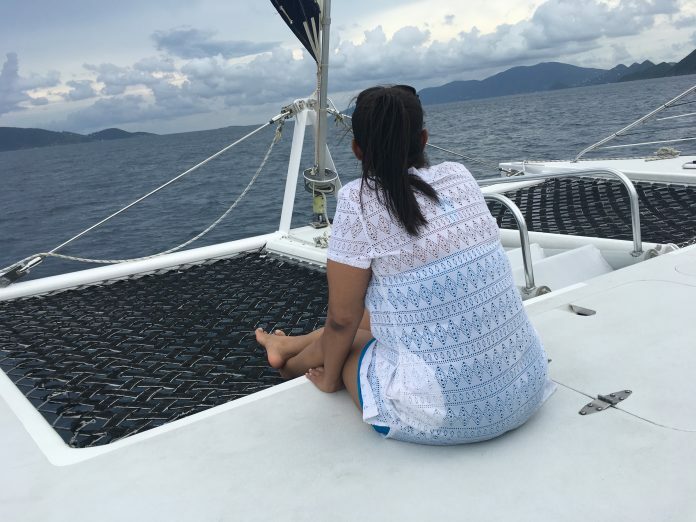 It felt great to take in the sights of the beautiful islands. 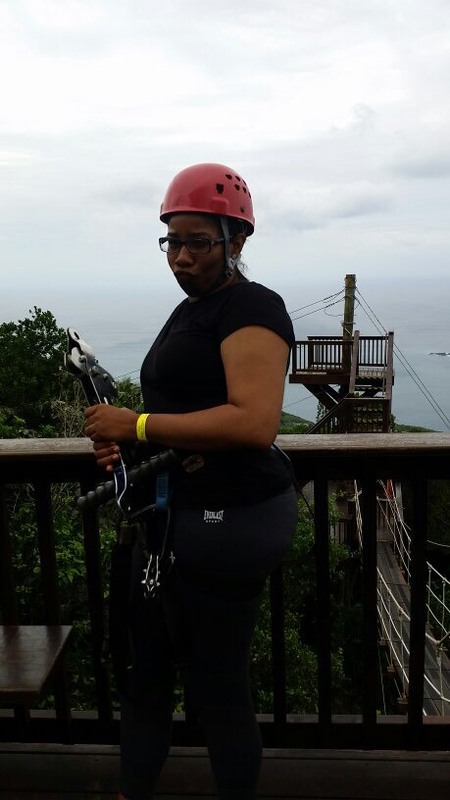 The next day we arose early and went ziplining… yes, zipline! I know, please don’t ask me what I was thinking. However, I’ve always wanted to do it and it didn’t help that I would pass by the place everyday on my way home on the North side of the island. Once again we picked the perfect overcast day to be outdoors enjoying nature. 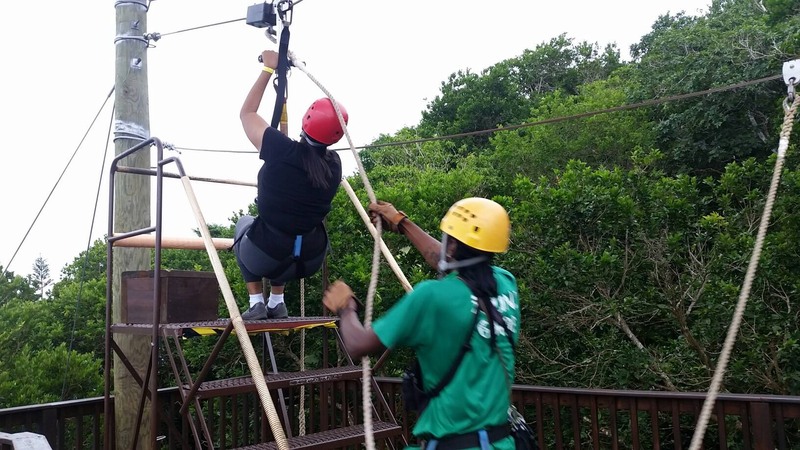 Even though it was my idea, I was the one screaming every time I had to jump from the zipline ledge (a total of 6 times!!!). 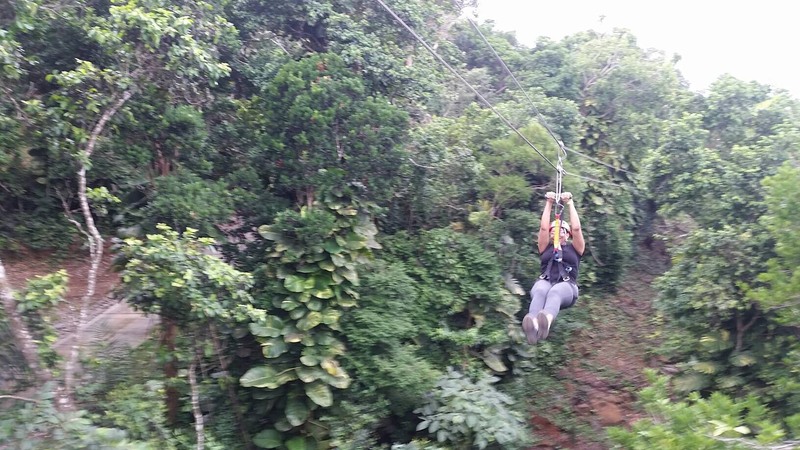 Zipline was an experience of a lifetime, and I believe everyone should do it at least once. Our zipline guides were some young locals and they made the experience very entertaining and enjoyable. Throughout our adventures we always stopped to eat at local spots. Some of the most delicious local dishes we enjoyed were conch in butter sauce, snapper fish, stuffing etc. I know we both gained a few pounds. We laughed, chatted and genuinely enjoyed each other’s company for her entire stay. The memories we created will last us a lifetime. It’s in moments like these that I am reminded that life was meant to be enjoyed. 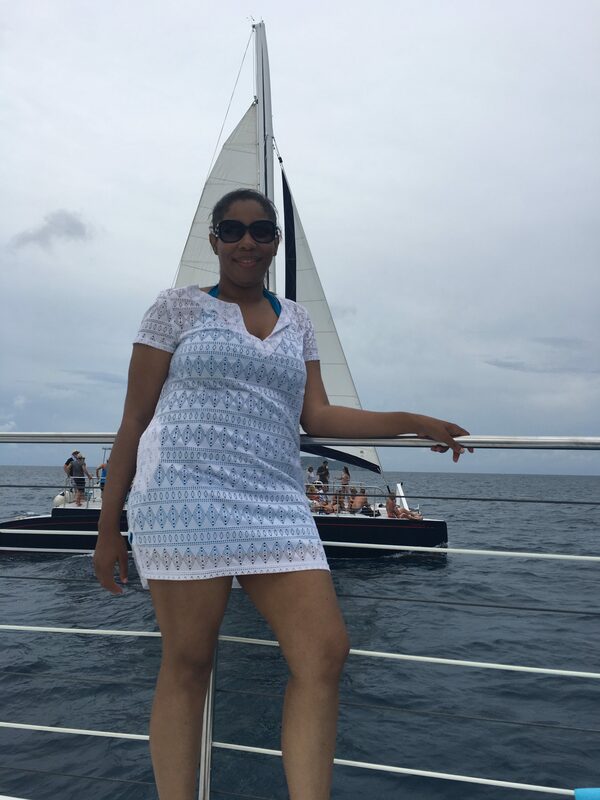 So as you read my post… I hope that you too are reminded to stop and smell the roses! Reminder… God Wants Us to Enjoy Life!